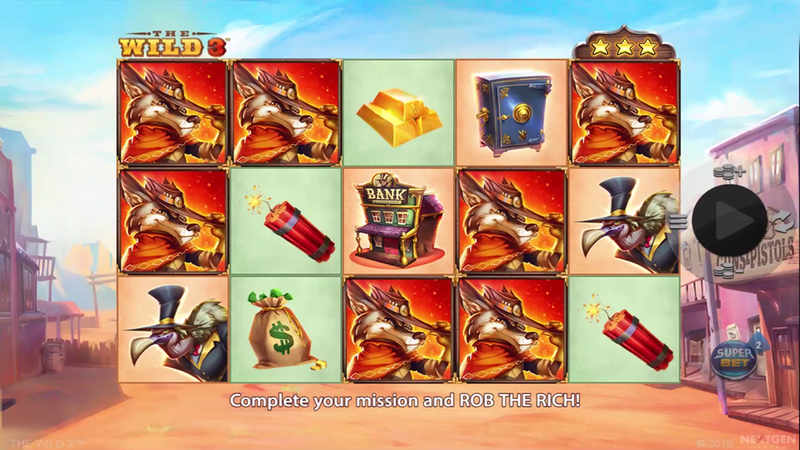 Get ready for a Wild-West-themed adventure and play different missions in The Wild 3, a 5-reel 3-row 10-payline slot machine released in summer 2018 by NextGen. This is a level-based game where you earn Sheriff’s badges by completing 3 unique The Wild 3 Bonus games including Lock n’ Load and Any 5 of a Kind. Ultimately, there is a Big Win you can score of 25.000 coins if implement a proper betting strategy. Learn how to win and get some tips to help your progress after reading The Wild 3 slot review. Want to see how The Wild 3 works? Select a recommended casino site from the list below and start playing for free or real – our screenshots will give you a sneak peek! The main task is quite simple and standard: match 3 icons placed from left on adjacent reels to get paid according to the paytable. You can play for fun or for the real money, but both ways integrate a variety of betting combinations thanks to the coin denomination between €0.01 and €1 and wagers in the range from €0.10 to €100 per round. When playing this game for the first time, you’ll get a set of 3 randomly-generated missions including Big Win of 25x your stake, to trigger the Free Games Feature, get High 5 of a Kind (5 of any of the following: Vulture, Bank or Safe) of Low 5 of a Kind, Spin 100 or Win 20. Instead of a single Wild, the game offers 3 unique symbols able to replace all other but the Scatter. We talk about the Wild Raccoon that appears on the reel 3 and turns all items into Wilds, the Wild Coyote that turns Cactuses of all colors into Wilds, and the Wild Bull that adds Multipliers of 2x, 3x, 5x or 10x applied to the line win. Interesting, all 3 Wild Features may appear simultaneously and the winners get to enjoy all those benefits at the same time. When 2 Bonus icons and 1 Wild appear anywhere on the reels, the winners will receive 5 The Wild 3 Free Spins. Note that you won’t be able to re-trigger the extra rounds, but your chances to score a big win here are definitely increased. After all missions are completed, the winners will activate Rob the Rich feature – a mini interactive game where you have to choose 3 out of 18 cash bags to reveal prizes. This is the way to get Multipliers between 2x and 25x or up to 6 additional picks. An empty bag takes you to the base game. You can play online using any mobile device on various NextGen Gaming sites since this release doesn’t ask a player to download the iPhone app or the Android .apk file. 3. What is the RTP factor of The Wild 3? The RTP official info is still to be announced. This is a medium to highly volatile slot machine able to produce a massive amount of cash. With its interesting gameplay, attractive missions and tons of extra spins, we can see it as a massive hit no matter if you like the Wild West or not.